The author with colleagues has prepared a reference book for publication. The reference book on thermal and physical properties of heat carriers and working media in power engineering has been supplemented with the Internet site at http://twt.mpei.ac.ru/rbtpp which contains interactive open calculations [2-7] described in the “paper” reference book. This article describes some problems and disagreements arisen while preparing the copy for publication and the ways to tackle them. Recently the formulae in scientific and technical publications are more often presented as parts of calculations created with the mathematical packages (Mathcad, Maple, Mathematica, MatLab, etc.) rather than rows of symbols entered manually or by means of special programs (Word Equation, LaTex, etc.). Moreover, listed mathematical packages have their own tools to comment on a calculation and format texts-marginalia that enables us to prepare manuscripts for publication without help of special programs (Word, Adobe Acrobat, etc.). The most popular is a compromise technology. An author passes a plain text in a doc-file to a publishing house or editorial staff, which contains only formatted text and raster figures, for example, as bmp-files. In addition to the usual figures (schemes, photos, diagrams, plots) bmp-files sometimes contain formulae as screenshots of problems, solved in the mathematical packages. The fact that formulae are inserted by using the service of an intermediary, the mathematical programs, rather than typing directly is explained by the following reasons. One of them is that manual typing of the formulae (without testing them in the mathematical packages) may result in mistakes (misprints) made by the author and missed by editors and proofreaders while working at a manuscript or a layout of a book or an article. But the main reason is that recently processing of experimental data is done with mathematical packages as well as processing of different tables, plots or estimation of theoretical inserts with representing final and intermediate results. It is desirable to transmit all these manipulations into the book or the article without changes or misrepresentations. There are some other reasons of mathematical package expansion into scientific publications that are discussed below. Here some problems have arisen which demand solutions. Traditionally a comma is used as a decimal separator in Russia. But in the other countries (generally in the English-speaking countries) a point is used. Today the USA sets the tone for information technologies, so all basic programs use point as a decimal separator, even if they are created in Russia. Due to this, the text in books and articles inserted from a mathematical package contain points. At the same time, the numbers from the text describing the formulae contain commas. According to the rules, editors and proofreaders, who guard standards, forbid the author to put points in the numbers. Sometimes it is difficult to prove that we cannot substitute commas for points in the “computer” formulae. Otherwise, if a reader decides to copy such a formula from the book into a program he would be faced with an error. At the present time many countries that traditionally have used commas in numbers (for example, Germany) are gradually changing to points. Recently a German colleague gave the author his new book and asked him to let him know if there would be a comma in the numbers. It is necessary to draw a line under the point problem. Some of the publishing houses in Russia completely switched for points already. Here one can note something like Fronde aimed against the stiff rule, which isolates the country from “printing mainstream”. While perestroika of eighties-nineties of the last century, one of our revolutions, radical westerners believed that Cyrillic should be urgently substituted with Latin. Some of the newspapers and magazines ostentatiously used Roman instead of Cyrillic for printing. At that, they emphasized that Latin would help us to be acquainted with western values, to accelerate computerization process and so on. One can imagine if life were to make us substitute commas for points some people and publications would ostentatiously place commas as those Paris boys who continued playing fronda (a game with sling) after it was banned by police due to numerous injuries. The problem of point and comma is complicated by international financial format of numbers (###,###,###,###.##) in which a comma is a thousandth symbol and point separates dollars/Euros from cents. As a rule, engineering and scientific calculations do not require such accuracy and numbers are rounded even in technical and economic assessments, which contain physical quantities (mass, energy, time) and financial ones. The variable names can contain Latin, Cyrillic, and Greek letters. There are a row of values (constants and variables) that has been held traditionally fixed letter combination long before computer appearance. As a rule, the lists of such variables are placed in the beginning of a book. Viewing his “native” formula a specialist can understand what a certain variable holds. At that, the variables can have their “nationality” and “internationality”. Compare Din and Dвх, Dout and Dвых (inlet and outlet diameter of something). These variables contain Latin and Cyrillic letters. Although recently, Cyrillic letters are often rejected in the formulae for practical (not political) reasons. As we noted above, the formulae for articles and monographs are created oftener in mathematical applications. Some of programs have restrictions on using Cyrillic and even Greek letters, widespread in “international” formulae, in the variable names. Pure English variables in formulae significantly simplify scientific exchange. A professional who does not know Russian can find a specialized Russian article on the Internet by the English abstract and view its “English” formulae. Understanding their meaning he can order a translation or get into touch with an author. For the same reason the units of physical quantities in this article are international. Speaking of variable names it is necessary to refer to “variables-hieroglyphs”. A reader may think the matter is China, Japan, Korea and other Asian countries those scientists insert hieroglyphs into the variable names. But what is at issue that some variable names in some branches “are covered with” superscripts, subscripts, character strokes and other specific symbols and look like hieroglyphs now rather than abbreviation. These hieroglyphs are easy to write on a piece of paper or on a blackboard. Having skills one can insert them into a file by means of Word Equation or LaTex, although it can be absolutely impossible to insert them in a mathematical application. Such composite names should be simplified: deprived of multistoried form, transformed into the text form. Approximately in this way the Chinese, the Japanese, the Korean have to simplify their scripts to feed data into the computer. For this reason compound names in many disciplines have got their simplified analogues. Symbol of the definite integral could be entered as a picture, by a character set, or typing int(f(x), x = 0..1). As was noted above, many authors place lists of variables in the beginning books and articles. The variables are often presented in a table: the first column contains the name of the variable, the second —its dimension (about dimensions see section 5), and the third contains its description. If a book or an article contains fragments of a program or records of a problem solution in a mathematical application the table is completed with the column containing identifier of the variable used in a computer solution of the problem. Sometimes this column substitutes the first one, containing traditional names of variables and constants. With an expansion of the mathematical packages into the books and articles such a substitution will be more intensive and we will have to forget traditional “hieroglyphic” notation of variables and even some operators (see section 7 below). On the other hand, creating new versions developers of the mathematical packages try to take into account traditions of the variable notations and introduce new tools for their formatting. Thus, Mathcad enables us to include superscripts and subscripts, mathematical symbols. Although, such complicated variables should be put in brackets: [HCO3-], [Dinmin], etc. To make the formula work in the mathematical package it is necessary to change the positions of the formula and the list of its variables and previously enter numerical values: see Fig. 1— screenshot of the problem solution in Mathcad. Figure 1. Calculation by the formula in Mathcad. It might appear excessive to display numerical values with the formula. However, we should pay attention to the following important tendency of processing technology. The calculations created in Mathcad and in the other mathematical programs could be published on the Internet for interactive work. Figure 2 shows the webpage with address http://twt.mpei.ac.ru/MCS/Worksheets/pv-RT.xmcd. A viewer can change initial data in boxes, click the button labeled Recalculate and get a new result — temperature calculated by the formula (1). “Aerial acrobatics” in the formula publication, especially in the electronic edition, is to place link to the site near the formulae where the formulae should work: if one changes initial data he gets a new result. The author works in a research team from the International Association for the Properties of Water and Steam (www.iapws.org). This association prepares and publishes formulations used to calculate various parameters of the important natural substance. Usually the formulations are published as PDF-text which contains “dead” formulae. Figure 3 shows a part of the formulation for calculation of the ionic product of water, product of concentration of H+-cations and OH--anions in water. Recently at the suggestion of the author and his colleagues  the formulations have been published as a set of “living” Internet formulae. A viewer can use them for calculation. 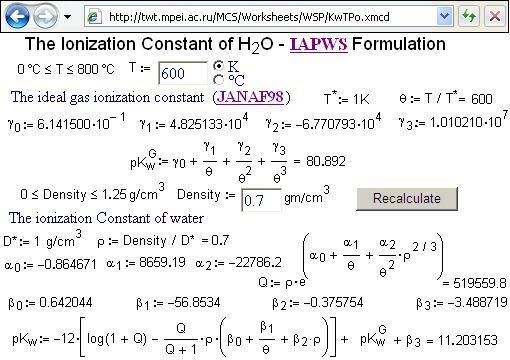 Figure 4 shows the network document that enables us to calculate the ionic product of water Kw, or rather negative common logarithm of this value pKw depending on temperature and density of water. Figure 4. A “living” Internet formulation for properties of water and steam. 1. To get acquainted with a calculation method (probably, it is better to study traditional PDF-documents). 2. To make one-time calculations: change the initial data and get a new result. 3. To create easily and to check out quickly corresponding programs having not only aggregate results (as a rule, “dead” formulations contain check results for several points, too) but also all intermediate data. 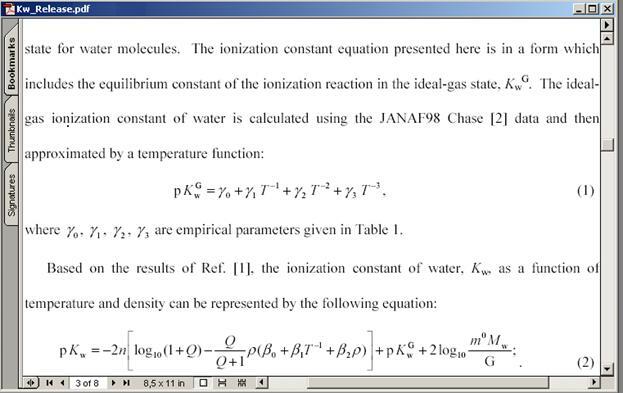 Figure 4 shows all formulae of this “live” formulation are supplemented with numerical values. In the beginning of the article it was announced book . So, all the formulae of this book have their “network-interactive-open” analogues. They were developed by the technology shown on pairs of Figures 1-2 and 3-4. Authors of the other similar books enclose disks with programs to calculate by formulae from the books. But this technology is obsolete if we take into consideration that almost all computers today are provided with the internet access. Although, downloading instead of program setup from the disk enclosed could not solve the problem completely. It should be noted that the following tendency will change users’ lives in the near future: cloud computing, providing with remote computational power, disk space, and link channel. Apart from everything else, users have to utilize cloud computing due to high costs of license for standalone computers, leasing of premises, power, software piracy countermeasures, and the trends described in this article. There will be no need for a user to install applications in his personal computer as he will find everything on the Internet at a moderate charge or free of cost. There is additional advantage in location of calculation programs on the dedicated server instead of distribution of disks enclosed to the books. If one find an error in the program or just a misprint in the comments it can be corrected quickly and by insensible degress. Such server can also contain continuously complimented list of misprints from the book itself (this experience is being spread currently). The book that has numerous spider lines of the references into a server can be considered as continuously “reprocessed, supplemented, improved” publication. Different problem books and work-books contain plenty of formulae. The author with the students used to transfer some of them, connected with power engineering, into the “network-interactive-open” format. If only you know how many errors and misprints were found there! These are not only traditional errors (a squared variable instead of that rose to the third power) but also non-disclosures/omissions which a specialist can guess at long last. But the mathematical packages refuse forthright to “excuse” these non-disclosures/omissions and give error messages. It is difficult to accuse an author, an editor, far less a proof-reader: reading closely a text is one thing, but another thing is checking carefully the formulae without using them for calculation. Numerical results are rounded in problem books and work-books and these rounded values are transferred to the following formulae that can result in errors in intermediate and final results. Mathematical packages treat non-rounded values, or rather not so much rounded results (turning to Figures 1 and 2, the value 574,7924189533622°C instead of 574,79°C, or rather 847.9424189533622 К instead of 847.94 К; the results are displayed in Celsius degrees but the program operates with Kelvin). This makes calculations more accurate but creates a problem of the difference between “live” and “non-live” work-books. The “revival” of formulae from problem books is very useful with another respect. The network calculations checked and published on the Internet have not only educational but also practical trend because they are used to solve certain problems. In this case a work-book turns into convenient and valuable reference book. Specification documents (for example, construction standards and regulations) can be classed as specific type of work books. There are a lot of formulae which could be revived on the Internet. Besides, the author does it within the framework of power engineering standards. 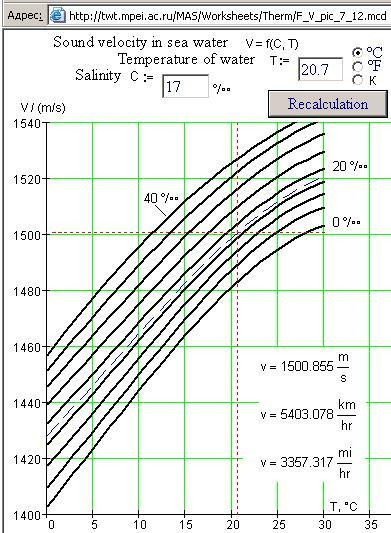 Thus, a viewer can see one of such “live” regulatory documents, construction standards on heat insulation depth in a heating network at http://twt.mpei.ac.ru/MCS/Worksheets/Thermal/Izol-Trub-Teploset.xmcd. Talking about regulatory documents we should discuss certification of calculations. Fidelity of information containing in the “paper” reference books is confirmed by publishing houses with their scientific consultants, editors, and proof-readers. As a rule, the Internet pages are created without being edited and corrected. However, the author has collected a row of misprints in the reference books of respectable publishing houses, for example, 0,02387 instead of 0,02387 ( 2 was a subscript that stands for a number of repeated zeroes), or 72,93 instead of 27,39 (obviously, the number was typed by a man who spoke German, because in German “seventy two” sounds as “two and seventy” and “ninety three” — as “three and ninety”), etc. Such mistakes are practically impossible to find by traditional (visual) proof-reading of “paper” reference books. Nevertheless, the mistakes still remain with all that they imply. There are two possible ways to certify calculation documents published on the Internet. Firstly, a trustworthy organization could confirm accuracy of calculations by a letter published on the Internet. Secondly, sites of “trustworthy organizations” could make references to the correspondent calculation sites. Plots and tables in the reference books, monographs, and scientific articles are special type of formulae (hypostasis of formulae, see the title of the article). 3. Unspecified curves (“sketches in handwriting”) given for qualitative evaluation. It is hard to calculate by them because they have no grid or points on the ordinate, they only illustrate certain dependences. The first and the second groups of plots are easy to animate on the Internet by technology described on , in the chapter “A plot in a calculation site”. Thus, Figure 5 shows a network interactive plot having relation to the first group that presents relationship between sound velocity in water/steam, pressure, and temperature. The isobars shown in Fig. 5 were plotted by the formulations approved by the International Association for the Properties of Water and Steam. A viewer can change initial data, click “Recalculate” button, and get not only a new numerical result (sound velocity in water/steam) but also a new isobar, new dashed lines, which fix the point of the curve. This allows him to understand in depth various laws of water/steam. There are sites that demonstrate isotherms and even surfaces in 3D space. Also there is a site that shows all “live” formulae of the isobars from Fig. 5. We can also endeavour to publish on the Internet plots from the second group that have no functional connections (digitization and obtaining discrete values on the curves, approximation or interpolation, etc.). Thus, as an example, Figures 6 and 7 show two plots: Fig.6 — sound velocity in sea water versus temperature and salinity, a scanned curve from the reference book “Physical quantities” (Moscow, Energoatomizdat, 1991, see site at http://twt.mpei.ac.ru/PVHB with “live” calculations from this book), and Fig. 7 — the same plot, published on the Internet, which constructs wanting isoline, calculates sound velocity, and fixes the point on the curve. Reference materials also contain various nomograms and such prompts: mark on the first argument on the left scale, and the second argument on the right scale, draw the line between each mark and read off a result on the middle scale. In nomorgams the physical meaning of a problem disappeared (a generation of engineers used them), but accuracy of calculations increases. There were produced simple mechanical devices similar to slide rule containing the calculation algorithms. Such devices had been used by navigators laying the routes of sea-crafts and airplanes before time of on-board computers and global positioning systems. Today one can buy suchlike in news-stand – combine your weight and height on two disks and learn if it is time to go on a diet. Nomograms are easy to “enliven” on the Internet, too. Besides formulae and plots, reference books, monographs and articles contain different tables, discrete values of functions of one, two, and three variables. The tables could be divided into two groups (not three as plots): the tables containing discrete values calculated by known formulae and tables containing empiric (experimental) values, which are not connected explicitly with formulae. The tables from the both group can be also “digitalized” and published on the Internet for interactive use. We can see a part of the table from  at the top of Fig. 8 containing discrete values of three bivariate functions (pressure P and temperature T) returning specific value (v), specific enthalpy (h), and specific entropy (s) of water/steam. Figure 8. A table containing properties of water and steam. In age of the Internet tables serve for filling of a reference book volume, for expansion its data sheets. Tables are of little avail for common use. For example, if one has to solve a direct problem, to find specific enthalpy from pressure and temperature (see table in Fig. 8), it can be solved quickly by simple interpolations. Although, it is hard to work with the table, shown in Fig. 8 in case of an inverse problem, for example, finding specific enthalpy from pressure and specific entropy (frequently encountered heat engineering problem). In this situation the Internet calculations serve the good turn. Thus, at the bottom of Figure 8 there are two sites in which one can solve described direct and reverse problems without additional interpolations and iterations. It beards mentioning marking of coordinate axes. In home and foreign publications if pressure plotted along the axis is expressed in megapascals, we can see marking like that: р, МРа | р [MPa] | p / MPa ( the symbol “|” is placed here to distinguish the first comma). The last form of marking (American) could be considered as a correct one. For example, a point corresponds with value 12 and this means that p / MPa=12 or (after the pressure unit has been transferred from the left side of equation to the right side) р = 12 МРа. This rule is especially useful if dimensions contain multipliers. Let us consider a plot representing dynamic viscosity on the y-axis. The dynamic viscosity is measured in micro-Pascals multiplied by seconds: μ / (10-6 Ра s) = 100 → μ = 100·10-6 Ра s → μ = 0.0001 Ра s. Everything is reasonable here: the dynamic viscosity equals to one tenthousandth of a Pascal multiplied by a second or hundred microPascals multiplied by a second. This value can be inserted into the calculation. But Russian reference books contain not only right notation on the plots and tables, μ · 106, Pa·s or μ, 10-6 Pa·s, where comma means division sign, but also incorrect ones, where the comma is placed incorrectly (μ, 106 Pa· s) or an exponent sign is placed incorrectly (μ · 10-6, Pa·s). American way of plot marking is handier: in this case it is placed division sigh explicitly, not its little known “pseudonym”, a comma. Although, here incorrectness takes place: sometimes we can see a marking t / °C or Т / °F on an American plot. The sign “/” means not division but more complicated dependence, including constants 273.15 К or 459.67°R. In this case it is better to write t, °C or Т [°F], instead of t / °C or Т / °F, where comma or brackets mean symbol of “more complicated dependence” (as shown in Fig. 5 and 7). Symbol / means division in the case of t / K or Т / °R marking, Rankin or Kelvin absolute temperature scales . Let us return to formula 1 and its explanation. One may often find formulae with units noted additionally in books and articles. All the formulae are known to fall into two groups by value, their external view and description: formulae connecting physical quantities and formulae connecting physical quantities with fixed units. The first group of formulae (F=a·m, E=m·c2, etc.) describes our theoretical ideas of the world around. The second group, so-called empirical formulae, describes experimental data. They have not been subjected to deep theoretical study yet that takes away “humiliating” adjective “empirical”. Description of formula 3 also includes units, therefore this formula can be considered as empirical one. But it is wrong — this formula is rigorous “theoretical”, following from Clapeyron equation р·v = m·R·T. Formula 3 can be considered as pseudo-empirical. Formulae of this type, coefficient-burdened, are often met in scientific and technical literature. Returning to formula 3 it will be observed that molar mass is measured not in kilogram per mol as SI system demands, but by convention in gram per mol, which is settled down and fixed in various chemical and physical reference books. There is no coefficient 1000 in formula 2. Why is it so? Up-to-date mathematical packages such as Mathcad and Maple work not with values (programming languages and table processors can do this) but with physical quantities, mass, volume, amount of substance, temperature, etc. These packages make corresponding additional conversions of units as shown in Figure 2. Moreover, these packages control dimension correspondence and, roughly speaking, do not allow a user to sum up meters and kilograms that aids in quick and correct formula input. where η is efficiency of a power station expressed in absolute units. If this value expressed in percents, the formula turns into b = 12300/η. or η = 32 b= 12300/η = 12300/32 = 384.4 g/kWh. Having efficiency of 32% the power station burns 384.4 gm of reference fuel per 1 kWh of electricity. If someone inters this formula in Mathcad and tries to calculate by it using units, the result will be dimensionless at best (see point 1 in Figure 9) or wrong at worst (see point 2). where Q=7000 kkal/kg, is combustion heat of reference fuel (anthracite of high quality, this value is easy to remember). Turning into SI system it was considered difficult to convert calories into joules, hours into seconds, kilograms into grams. After recalculation a new coefficient was obtained, which is also easy to remember — 123 (or 12300). As was noted before nowadays mathematical packages convert units, so the original formula should be returned into reference books (see point 3 in Fig.9). It will be better if reference books contain both formula with recommendations to use the first one (b = 123/η) for manual calculations or in “non-physical” programs (calculators, programming languages, spreadsheets) and the second (b = 1/Q/η) for calculations in modern “physical and mathematical” programs that have built-in units. The errors connecting with misuse of units have followed human in all fields of relations. For example, Peter the Great rebuked prince Kurakin in his letter of 1714 that dimensions of ships in ordered plots are smaller than required because there had been used Amsterdam feet instead of those English. In our age, the age of manmade disasters, consequences and damages of such errors could be significant. Here are two examples concerning our time. the fuel load. At that time Canadian airlines replaced Imperial System metric system (in which volume is measured in gallons and mass — in pounds) with SI system (liters and kilograms, correspondingly). For fuel load recalculation it was required to multiply indication of fuel gauging system (in liters) by corresponding density and obtain kilograms. The pilots used previous value of density (in lbs/gal) instead of that measured in kg/L. As a result, the plane was fueled with half of required amount. Similar mistake resulted in a failure of American orbiter Mars Climate Orbiter (MCO). It was launched on 11 of December, 1998 on a Delta-7475. The spacecraft reached Mars in 9 months, on 23 of September, 1999. At the calculated time it executed engine burn at attitude of 193 km. In 5 minutes the spacecraft passed behind Mars. The contact was never established and no further signal was ever received from the spacecraft. Findings of the failure review board indicate that a navigation error resulted from some spacecraft data being reported in Imperial units (pounds-force) instead of metric (newton). This caused the spacecraft to miss its intended 140–150 km altitude above Mars during orbit insertion, instead entering the Martian atmosphere at about 57 km. The spacecraft would have been destroyed by atmospheric stresses and friction at this low altitude. The orbiter cost 125 million dollars. There is another engineering mistake that may be mentioned here. It is connected with relative scales rather than units themselves. It was constructed a bridge across the Rhine. One side was made by the German, the other side by the Swiss (both countries are noted to have high technology level). When spans of the bridge were to be joined it was occurred that the difference in attitudes amounted to almost half of a meter. The mistake arose from the civil design standards of zero altitude: in Germany it is level of the North Sea, in Switzerland — of the Mediterranean Sea. Any specialist in any branch of science can make examples of such mistakes and cases connecting with misuse of units. This problem is solved in some degree by rejection of manual calculations and use of computer “dimensionless” program languages. While transferring to SI system “the Augean stables were cleaned”: all formulae in new or reprinted reference and educational books were transformed so as to eliminate calories, atmospheres, kilogram-forces, and other out-of-date but widespread units. Now we generally use mathematical packages which can operate with units and this demands us “to clean the Augean stables” again. For example, it is better to give formulae in different notations considering tradition and up-to-date calculation technologies, supplement them with references to the Internet sites where one could calculate, make plots and get additional information unspecified in “paper” editions. Reference books should be published and reprinted. However, current reality should be considered, particularly, the case described in this article, when it is possible to transfer from a published formula to the “live” analogue in the Internet. One may ask a “seditious” question: do we need “paper” reference books? Yes, we do, but we need reference books with the other content and form. Mathematical packages, which can properly treat physical quantities, bring up one more peripheral question. While transferring to SI system publishing houses and magazine staff rejected manuscripts containing commonly used non-SI units. These changes were most noticeable in scientific and technical sphere where pounds, feet, etc. are used. 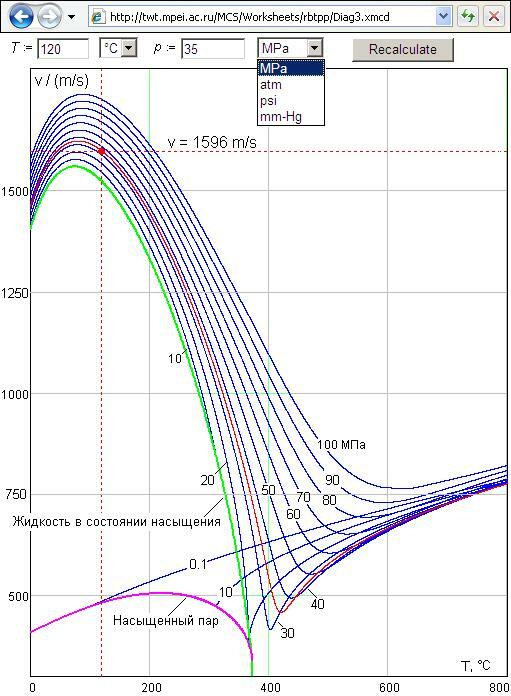 There are some peculiarities in Russia: we will never measure pressure in pascals, more accurately, in hectopascals, but we will operate with millimeters of mercury column. Here is a summary! Mathematical packages allow us to diverge from the strict rule that ordered in articles and books only SI units to be used. We used this possible future indulgence: in Figures 1 and 2 gas pressure was entered in standard atmospheres instead of hectopascals, as an editor could demand. 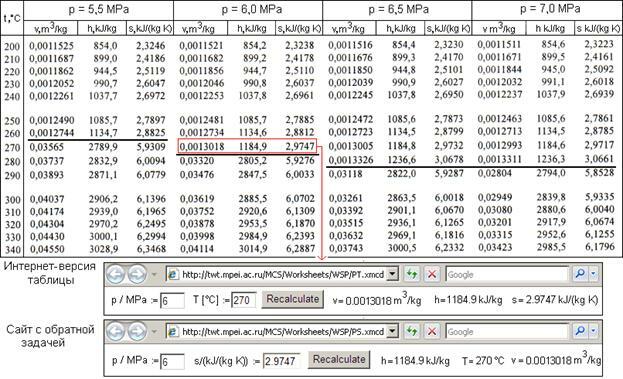 Figure 5 shows that to receive sound velocity in water/steam a site viewer can enter pressure in different units: megapascals, atmospheres, pounds-force per square inch, or mm of mercury column. He can also choose units for temperature: the Celsius scale, Kelvin, the Fahrenheit scale, degrees Rankine, or the Reaumur scale. Let us discuss “right” empiric formulae. As in our case, often evidence of empirical formulae is fractional values of exponents. Due to that in Mathcad the expression α = 3·р0,15·q0,7 gives wrong result with a “strange unit (see point 1 in Fig. 10). The empirical formula for heat exchange coefficient was obtained by statistical analysis of experimental data. The empirical formulae always followed by notes what units should have the initial values and what units are come out. The empirical formula should be supplemented with these units. That was done in points 2 and 3: the variables were divided by their units and the formula itself was multiply by the attributable unit. This yields a conclusion. If an empirical formula is introduced in a reference book, thinking of how it will be “enliven” in mathematical packages, it is necessary to insert units into the formula as shown in Fig. 10 rather than just mention what units should be used in it. There is no necessity to renovate such a formula, to recalculate new coefficient based on the modern system of units (which is undertaken in new reference books). We have already discussed briefly problems of different notation of mathematical operators in reference books and in mathematical programs in section 2. A cause of Mathcad popularity is that a user can insert mathematical operators in the way he did while studying mathematics in school and university. Due to this a Mathcad document is similar to a sheet with mathematical manipulation in script or typed in a text processor. However, our writing style of math expression “on paper” is also changing due to the influence of mathematical packages styles. A number of people assume that it is connected with decreasing of education level. The others believe it is due to inevitable process of mathematics computerization. Thus, not relying upon the default rule the square sine is often written as sin(x)2, or (sin x)2, or (sin(x))2 , or even (sin(x))^2 instead of sin2x. There is another example. Figure 4 shows formula Q = ρ · e(…) where constant e (base of the natural logarithm) is raised to the power representing a polynomial. To avoid errors it is better to replace the exponentiation operator with the function exp: Q = ρ · exp(…). There are lots of examples when a computer has an effect on writing of mathematical expressions: 10x is replaced by ext(x), |x| – by abs(x), etc. Special mention must be made of the mathematical symbol = (equal sign), which could be found almost in all the formulae in reference books. In mathematical packages this symbol is divided into several independent ones having their own notations. Regarding to Mathcad, the simple note in a reference book р = 12 MPa can have two meanings. Firstly, it means: value 12 megapascals is assigned to the variable p. In Mathcad this operation looks like: р := 12 МРа (see Fig. 10). Secondly, the expression р = 12 MPa could mean that it is displayed numerical value of the variable p calculated above (displaying of the result). Equal sign can have the third meaning, Boolean operator “equal to”, that separates left and right parts of equations. For example, the famous formula F = a∙m (Newton's second law) can be considered as an expression for calculation force value (F := a·m) having a pair of known acceleration (a) and mass (m). On the other hand, it can be considered as an equation F = a∙m by which we can define numerically or analytically value of a variable (F, a, or m) if two others are known. Hence, if a reference book includes a real calculation the equal sign should be treated carefully, be interpreted in different ways: as assignment symbol, displaying sign, or Boolean “equal to”. Mathematical packages demand us to reform notations of some other mathematics symbols customary for various science disciplines, to unite them in one “computer” notation. This thesis could be explained by an example connecting with heat engineering, formulation on thermal physical properties of ice. Figure 11. A fragment of the formulation on thermal physical properties of ice. Figure 11 shows the fragment of formulation on thermal physical properties of ice in the form of PDF file. 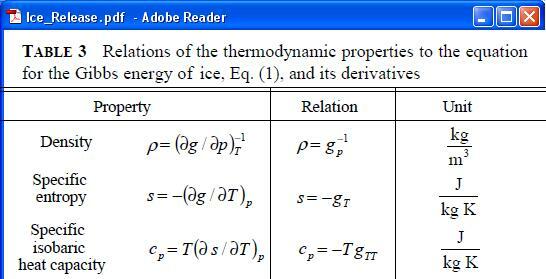 The given formulation recommends how to calculate density (ρ), specific entropy (s), and specific heat at constant pressure (cp) of ice from specific Gibbs free energy (function of two arguments: pressure and temperature) by partial derivation. At that, special notation of partial derivation is used that was accepted in thermodynamics more than century ago. This notation is quite muddled: sometime (see Figure 11 column “Property”) the subscript indicates partial differentiation with respect to the variable marked in the subscript, another time, vice versa, this variable is constant (column “Relation”). There are other notations of partial differentiation in thermodynamics. What makes it more difficult to read is that only function name is noted in derivation, but arguments of a function are not listed (just g instead of g(T, p)).The same could be noted in respect with other mathematical operations and functions . This confusion is the reason that students and experienced specialist make errors. As was noted above, mathematical packages cannot put up with such defaults. Or rather, adjustable and versatile mathematical packages cannot take into account all nuances and distinctions of notation of the same operator in different science disciplines. Therefore, users have to adapt themselves to capabilities of mathematical packages. Figure 12 shows an open interactive network version of formulation of ice properties. Derivate notation built in Mathcad was used there, which is clear for all users. As shown in Fig. 12, Mathcad has got distinct symbol for partial differentiation which does not need indicating of constants. This notation style should be used in formulations, in modern educational and reference books. This relatively new technology of publication combines optimally pluses and minuses of tradition and online publications. It was done before time of personal computers, on a typewriter. At that time formulae were inserted manually into a typewritten text while preparing articles or workbooks for prompt printing. Now it is better to say not manuscripts, but something like “compuscripts”. To get a screenshot one should press PrtSc (Print Screen). The “figure” appears in a clipboard. Then it could be edited for example, in the graphic editor Paint and saved as a file. Before MS Windows (this system includes as clipboard as Paint) in the times of MS-DOS one could print the entire display screen. This explains quite obsolete title of the button. There are some exceptions to the rule. Excel enables a user to choose between point and comma as a decimal separator. But substitution comma for point causes some difficulties and hampers file exchange. "If in the first act you have hung a pistol on the wall, then in the following one it should be fired. Otherwise don't put it there." Chekhov's principle of drama can be used here. If you have put a formula in a book it should calculate. “Non-English-speaking” China and Japan switched over to the points long ago. Some of “non-Slavic” republics of former USSR, Azerbaijan, Moldavia, transferred to Latin. In Uzbekistan both Cyrillic and Latin are used (something like “diarchy”). Here one can see Russophobia, but the main reason is to become familiar with the dominating alphabet. It also dominates in information traffic. The Balkan country, united some time ago, was divided into two, due to alphabet among other things: Cyrillic is used in Serbia and Latin - in Croatia. Ukraine may be recommended to choose Latin to insulate itself completely from Russia. Some of Internet sites suggest a viewer to choose the alphabet, Cyrillic or Latin, to read Russian (Ukrainian, Belorussian) texts. The author intended to add a footnote just after the word fronda appeared for the first time but didn’t want to hurt feelings of a literate reader. Moreover, as a rule, a reader is connected to the Internet where he could query corresponding information. The author queried the word “fronda”. There was no information in Russian about connection between La Fronde and a sling. He could find answer only in old paper reference book La' Rousse and added some facts to the Wikipedia article. So, paper reference books will feed the Internet for a long time. A reader has noted that there are lots of footnotes in this article. It might be said that the author use them excessively. He inserted a footnote even in the title. Instead of making footnotes it is possible to hint a reader that he can query all “dark” terms on the Internet or in a paper reference book. Such method of reading becomes widespread. Let us hope that a paper reference book or our mind keep generally accepted comment. A bridge between Latin and Cyrillic alphabet. Chinese, Japanese, Korean scientists have already “Anglicized” formulae in the books and articles. Moreover, they write in English more often, otherwise the global exchange of ideas would be difficult. One can admire a sculpture and wonder: “How can a sculptor see a Jupiter hidden in a slab of Carrara marble and bring it to light, chipping off its shell with chisel and hammer?”, or thumbing old “pre-computer” mathematics reference books can marvel that a case-man could create such “works of visual arts”, the most complicated mathematical and chemical formulae. The author has developed a special technique to substitute pictures for complicated variable names in the network calculations [ ]. In this case there was not any analytic transformation (symbolic mathematics). 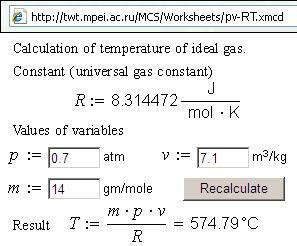 It is described numeric mathematics, see text before formula (1): “temperature is calculated by the formula”. This is a figure inserted into the text — screenshot of the problem solution in Mathcad as a bitmap picture rather than vector one. Further one can read the webpage addresses in a title of the figure, the Address Bar. This is a figure inserted into the text — screenshot of the problem solution on the Internet. In this context the author has doubts as to which conjunction is more suitable: “or” or “and”. Up-to-date publications sometimes contain a certain newspeak: a hybrid conjunction or/and, but editors object to it. The fact is that Russian and many other languages have no word combining terms “water and steam”. In everyday life we treat water or damp steam, steam containing drops of water. But we cannot separate substance into water and steam at supercritical parameters (see Fig. 8, line in the table). Thus, families of the Amazonian region have no word “forest”, although they have “thick forest”, “sparse forest”, etc. So, we shall call the substance “water/steam”, introducing a new conjunctive “/”, abbreviation for “and/or”. The word “open” in this trine means the following. One can find a lot of WebPages working by scheme “enter initial data, click the button and get a result”. But formulae themselves and the intermediate values are close to viewers. A problem book compile problems and their solutions, which as a rule are placed at the end of a book. A work book is complimented with detailed description of solution, formulae with quantification. Poor insulation thickness results in unacceptable heat lose. On the contrary, superfluous one brings overrun of the heat insulator. This typical technical and economical problem could be solved on a case-by-case basis but using of construction norms and specifications gives decrease of design cost. Of course, display shows a flat object. But tools for strengthening of the third dimension (highlighting, perspective, distance fog) do part: we see a “real” surface, which we can even rotate to study it better. The pressure is atmosphere by default here. Figure 5 shows similar dependence for pure water considering pressure. This explains low quality of the figure. 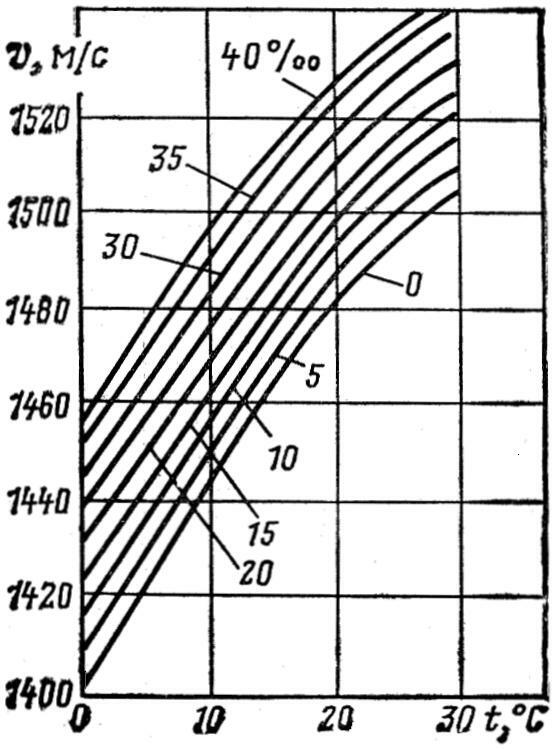 Initial values of pressure/temperature seldom coincide with those fixed in the top portion and/or in lateral part of the table. To make these values coincide more often we have to decrease step of discrete values of pressure and/or temperature and therefore to expand the table, which, in turn make it less convenient for use. Multiplication sign (·) is often missed here, that confuses a reader more. It is also typed in Word Equation. Sometimes similar adjectives can conversely rise but not minish a term. Here is a simple test of scheme “science-mock-science”. Compare: recreational mathematics (physics, chemistry, etc.) and … recreational astrology (chiromancy, political science, etc.). A dispute is holding now if theology is a science discipline. Add word “recreational” to the term and decide what is what. We call it Mendeleev's-Clapeyron equation in Russia. We also call Periodic Table of Elements as Mendeleev's Table. Although, the Russian not to leave a favour unanswered: one of the water/steam diagrams is called h, s – diagram, not Mollier diagram. The problem of calling formulae and scientific invention is a distinct topic of conversation. In this case the variables were separated by points, multiplication signs. But, as a rule, points are left out in books because a “literate” reader understands that mRT —are three variables. In addition, a reader sees n instead of m in the European books. Here globalization processes demand clear standards and refusal of defaults, of different notations. Kilogram is quite strange SI unit. For some reason, this basic unit includes multiplier kilo. As a result one could recognize unit µg as µkg that is gram and make a thousandfold mistake if the default principle does not help. More precisely, with units: different physical quantities sometimes have same units. The author tried to reveal this peculiarity in a separate chapter of monograph . As shown in Fig. 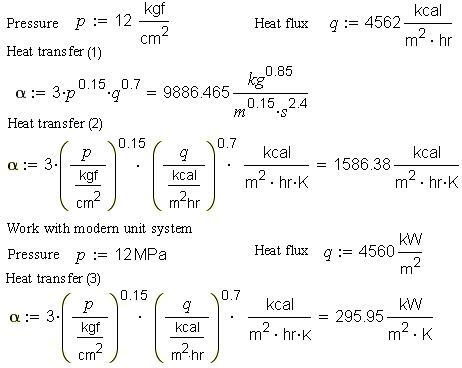 2, the temperature obtained is represented in customary scale, in Celsius (which is not basic temperature unit) rather than in Kelvin (absolute thermodynamics scale of temperature). Mathematical packages enable us to change units by default (Kelvin in our situation) to that more convenient. However, the scientific editor will most likely object it by stating that if we mean absolute temperature as opposed to relative, we could use the variable T rather than t (or even θ (Greek theta)), so as to avoid mixing it up with t, which normally stands for "time". Since physical quantities “were driven out” from manual calculations and computations and automatic unit conversions are impossible (all the more for relative scales), we use two symbols for temperature and for some other physical quantities. If the editor demands to use different symbols for absolute and relative temperature it is necessary to reserve two different names for pressure, for example, pressure in Pa and in atm. Such defaults are often met in formulae. As the volume of one kilogram of water is one liter at standard conditions, this unit density is cancelled out. However, an error arises if this formula is entered in Mathcad. In fact, the result is 384,375 but values should be rounded off properly. 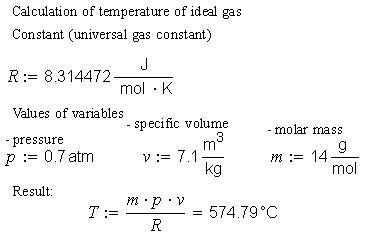 This formula is more suitable for education: a student should think of what the reference fuel is and what equals its combustion heat. It is often considered in the old way that Celsius degrees (“sea-level”) differ from those Kelvin (“centre of the earth”) by the value of 273. The right value amounts to 273.15. This temperature inaccuracy results in errors. It may be argued that we “dirty the stables” rather than clean them presenting a reader with two variants of a formula. It is often published “degrees Celsius”, but there is a mistake or rather, metrological default. The point is that Celsius degree equals to Kelvin the same as Fahrenheit degree equals to Rankine degree. However, the Celsius scale is shifted towards the Kelvin scale by 273,15°C (K) and the Fahrenheit scale is shifted in relation to the Rankine scale by 459.67 F (R). A scientific editor will object it saying that let it be Rankine/ Fahrenheit but none of obsolete Reaumur. Although, what can we do with such quotation: “The afternoon sun blazed with such energy that even the Reaumur thermometer hanging in the excise officer's room lost its head: it ran up to 35.8 and stopped there, irresolute.” (“Minds in ferment” by Anton Chekhov). A reader will not understand it if eliminating out-of-date units we bring the efforts to a successful conclusion. All is clear here. Computer is a kind of thing: as you sow, so shall you reap. A program in this example accurately raised units to fractional power. In this case “European” Mathcad displays the value in the base unit of pressure, in pascals, but a user can change the unit to the acceptable, for example to atmospheres. In Mathcad equal sign is the operator of numerical value output and “bold” equal sign is Boolean equal sign. There is a typical example. In mathematics and in many engineering disciplines imaginary unit is written as i. However, in electrical engineering it is labeled as j because letter i means here current rate. For this reason a mathematician (or the mathematical package) sometimes could not find a common language with an electrical engineer. For example, Mathcad enables us to choose the symbol to work with i or j.